Pit lanes are one-way. Only one car in this photo is facing the right way. What’s this Mazda doing? The No. 70 Mazda has been having clutch problems throughout the race, and it was time for it to go behind the pit wall for a lengthier repair. Only, um...this is how you’re supposed to get there. Shane Van Gisbergen was pulling in the No. 50 WeatherTech Racing car as the No. 70 was being pushed along at slow speeds into the direction of oncoming traffic. 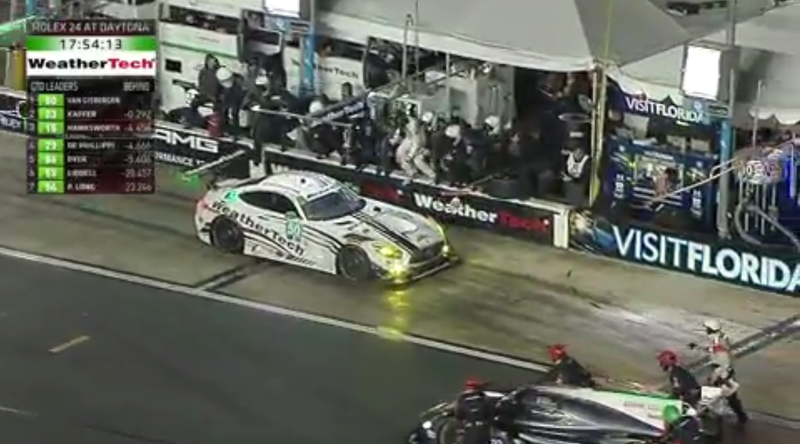 Fortunately, it is out of the way now and safely in Mazda’s garage, but that’s incredibly sketchy. Rain has finally arrived at the 24 Hours of Daytona. We know rain brings chaos—and it has delivered so far with plenty of spin-outs and offs as drivers try to keep it together in changing conditions—but a car being pushed the wrong way down the pit lane isn’t what we expect.